The large format outdoor printer has just become more versatile and productive than ever. Introduced at this year’s SGIA EXPO is the PrismJET VJ48-G Banner printer. Through our unique partnership with Mutoh, we recently introduced the PrismJET VJ48-G. The “G” stands for grommets. This is the first roll to roll inkjet printer engineered to accept pre-grommeted rolls of banner media. Since banners are the top selling product in the average sign shop (Some estimates put it as high as 40% of all sales! ), this innovation can dramatically impact the profit and productivity of sign makers everywhere. This post will provide an overview of this exciting new printer. Let’s take a look at the product, its pre-grommeted media, the profits and the process. 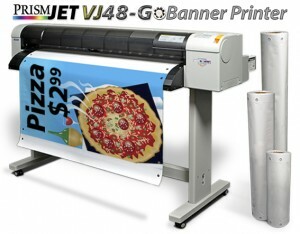 The first thing you should know about the PrismJET VJ48-G Banner Printer is that it’s much more than a banner printer. It’s like the Wizard that Jerry Seinfeld bought for his father Mortie. Mortie only used it as a tip calculator so he never full appreciated its potential benefits. Likewise, if you use the VJ48-G only to print banners, you’ll miss out on a host of other profitable applications including vehicle wraps, fleet marking, wall graphics, backlit signs, storefront signage, POP floor graphics, window graphics, posters, decals, and more. It’s not a one trick pony. How does it do all that and print on pre-grommeted banners? PrismJET VJ48G Banner Printer has unique channels cut into the platen to allow clearance for the grommets. 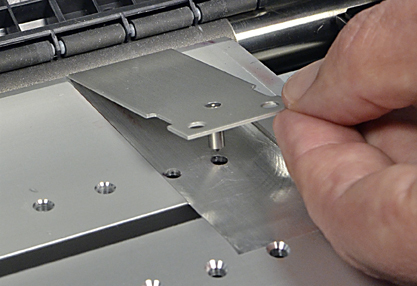 The PrismJET VJ48-G has a unique platen with channels machined at specific intervals to allow the passage of grommets across the platen without the risk of head strikes. These channels are placed at the right margin and at intervals to accommodate two, three, and four foot wide banner rolls. They’re covered by metal plates during normal operation. See Fig 1. To load an approved roll of banner media, simply uncover the channel at the far right of the platen and the one that corresponds to the width of the banner media you’re using. Then load the media and print your job. If you do it really, really carefully, the entire conversion process takes about 30 seconds. You’ll notice I said “approved” roll of banner. 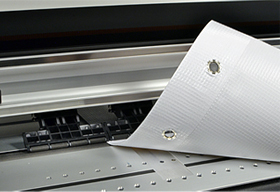 This process requires specially made banner media with thinner grommets that further reduce the risk of head strikes. Using standard grommeted banner material is like trying to run a modern car on leaded gasoline. It can cause mechanical problems and void the warranty. By the way, the specially formulated material, sold as Mutoh Ready2Print banner, is made from 14oz scrim with heat welded seams, so it’s not just more convenient. It’s also extremely strong and tear resistant. It’s a little more expensive, but the productivity gains more than make up for the added cost. Let’s take a look at the business case. PrismJET VJ48G prints all normal media. Remove the plate, and pre-grommetted media can be printed. Whether you’re currently printing banners and finishing them manually, printing them and outsourcing the finishing, or just outsourcing the entire process to avoid the hassle, a PrismJET VJ48-G will save you time and money. If you’re finishing your banners manually, and you spend 10 minutes finishing each banner, an order for 24 banners requires about two hours just for hemming and grommets. By printing on pre-grommeted material, you can cut two hours per day from your production time. That’s a 25% increase in productivity. Since time is money, you just gave yourself a raise. If you’re printing banners, but outsourcing the finishing, you’ll be able to stop paying the third party and reduce your turnaround time. You can take an order from a walk-in customer and have it printed and ready to deliver within minutes after design approval. At typical industry charges for sewing and grommeting banners, you can reduce your cost for 2’ x 6’ banners from $35.04 to just $9.00 each. Click here for a detailed cost and profit comparison. In addition to faster turnaround time, you get to put an additional $27.00 per banner toward your bottom line. What you do with the extra money is up to you. Mutoh’s Ready2Print banner media comes in rolls. Each roll is 72 feet long and 24, 36, or 48 inches wide. As noted above, the approved Mutoh Ready2Print banner media comes in specific sizes. Each roll is 72 feet long and 24, 36, or 48 inches wide. The super thin grommets are arranged in pairs so that you can print a section of the roll, then cut between the grommets to produce a finished banner of any length with grommets in the corners. After you have designed and printed a portion of the roll, simply advance the media and cut between a pair of grommets. You may opt to finish the edges with a dollop of banner tape and a quick fold or leave them as is. The welded seams extend 2” beyond the grommets along the top and bottom edges. You can design the image so that the printed area is entirely within the space defined by the grommets, leaving white upper and lower borders, or design it as a full bleed banner and print right over the grommets. To assist you in figuring out the proper dimensions, we offer a Ready2Print document sizing guide. One is shipped with each VJ48-G Banner Printer and we have added it to our Tech Support knowledge base for easy reference. Click here to download the template. Sometimes a small improvement makes a big impact in people’s lives. We think the new PrismJET VJ48-G is such a product. This innovation makes the large format outdoor printer more profitable and versatile than ever. It allows you to produce the industry’s most popular product –finished banners – more quickly and profitably.